Long time La Grande musicians Wayne Callahan and Jeff Grammer bring their most recent project / band ‘Elidila’ (pronounced elah – dee – lah) to the table. Elidila is wrapping up their first West Coast tour – playing with the likes of Tartufi, The Music Wrong, Lia Rose and many more. This experimental/rock combo recently added the bass of La Grande’s Matt Hibbert grounding their unique and edgy beats to the melodic and lyrical overtones. 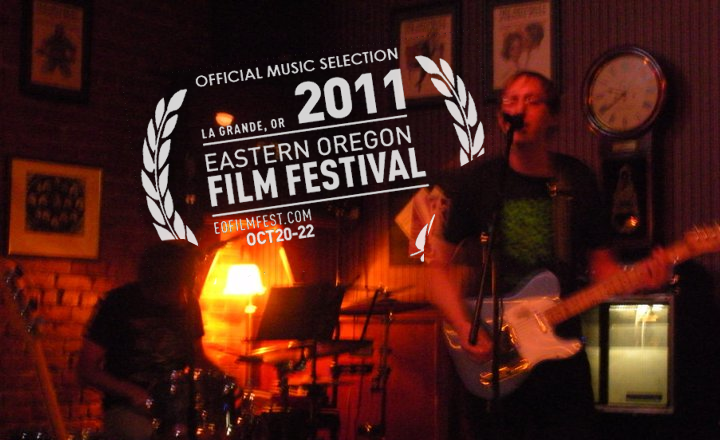 EOFF is stoked to highlight ‘Elidila‘ at EOFF 2011. “The Elidila of Perelandra gave to them dominion and rule of the planet. They were now old enough to take care of it. The Man and Lady know of evil, not by giving into it like The Bent One wanted, but by resisting it. Ransom spoke with them about what was the beginning of days of Perelandra and the end of the siege of Earth. Jeff Grammer and Wayne Callahan started playing folk music together about 10 years ago in La Grande, Oregon. After years of playing the random bar room show, senior citizen breakfasts, museum openings, weddings, etc. they eventually plugged in (and Jeff became a drummer) and were a part of many bands around town such as: Test Audiences, Black Bottle Trio, and City of Animals. Jeff has self-released two solo albums, and Wayne has self-released one album as his solo yet collaborative project, Correspondence School. After years of disappearing band members and the usual struggles of coordinating schedules and drama, they decided to give it a go as a duo being as that after all the years and people that had gone by, they were the ones still around, and it has definitely allowed them to concentrate and write new music. After the fizzling out of City of Animals, they took the winter of 2010-11 off from playing shows and started to write new music and figure out how to make a full sound as a duo. They also, in the midst of evolving their new sound, took on back line duties for La Grande favorites Sons of Guns with Jeff on drums and Wayne on bass. In a freezing cold basement at the end of this past winter, they made a record with Sons of Guns which will be out at the end of this summer. Jeff and Wayne finally debuted Elidila in May, and will continue to play shows throughout the summer, both electric and acoustic, to continue to shape their songs, develop new ones, and RECORD!! !